I was initially attracted to the physicality and the dynamic nature of sculpture and was intrigued by the profound impact sculpture can have on an environment. As for bronze casting, the medium dictates a certain sense of tradition and order, which I continue to embrace. The challenge for me is to take the medium and create a tradition of something new. My work over the last three decades has experienced quite an evolution, that from a representational artist to an instinctive artist. 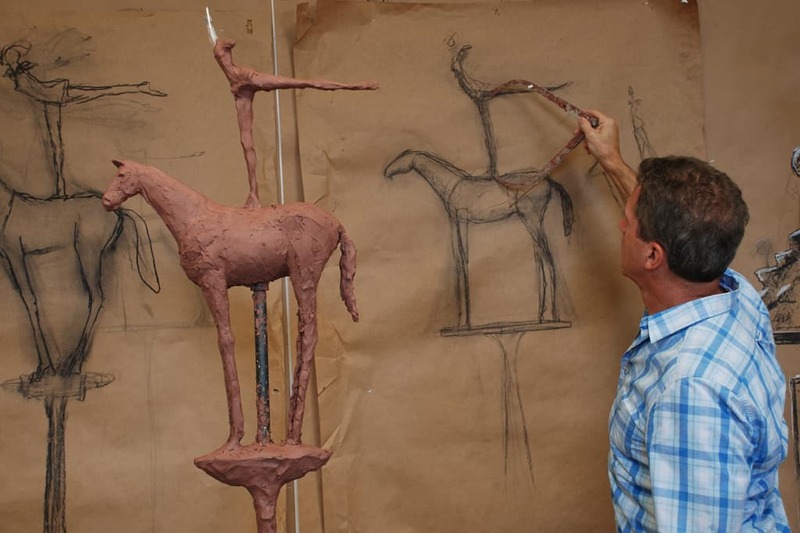 Where my early sculptures were modeled in a traditional manner, my current work is more abstract and serves as a metaphor for the human condition. The common thread running through my evolving style is my love of the figure as muse. As for my furniture designs, I would agree with Warhol when he said, “The line between art and design is often blurred. I float between sculpture and functional pieces incorporating similar images into each.” Functional art, as a result, seems to be a more appropriate title. My thought process in producing a new work is essentially a planned accident. I begin with a general concept in mind, but whether I end up with that concept is not important. A work in process has a mind of its own and can take you down a totally unexpected but more satisfying path.